DULUTH, Ga. – The Atlanta Gladiators have announced the full details for the team’s annual Hockey Fights Cancer Weekend on November 16th, 17th and 18th. The Gladiators tradition of painted-ice for Hockey Fights Cancer weekend will return, but with a new twist. At the ice signing event on Wednesday, November 14th from 6:00 pm to 8:00 pm, fans will have the unique opportunity to go onto the ice and paint the names of loved ones battling cancer, those who have survived cancer, or in honor of those who have passed away. The team will then play the three home games of Hockey Fights Cancer Weekend (November 16, 17, 18) on top of the names in the ice. To participate in the ice signing event, fans are asked to donate $5 to the Canvas for a Cause charity, who will also be attending the event. Aside from the traditional fundraising opportunities for Metro-Atlanta cancer organizations and charities all weekend, the team will have numerous chances to give back to the Hockey Fights Cancer cause at all three games. The showcase evening of the three games will be Saturday, November 17th at 7:35 pm. 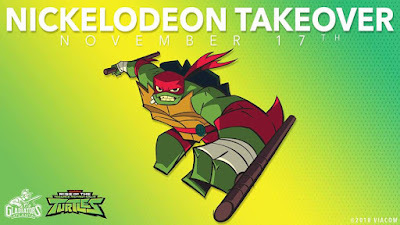 On this date, the Gladiators will host their first ever Nickelodeon Takeover Night with a, mainly, Teenage Mutant Ninja Turtles theme. Atlanta will wear special Teenage Mutant Ninja Turtles jerseys that will be auctioned after the game, with the proceeds going to the P4 Foundation. There will also be a meet and greet with two of the Ninja Turtles, Nickelodeon-themed activities, and much more that will be fully announced at a later date. Also, on Saturday, November 17th the team will have their first $5 Frenzy of the 2018-19 season. Fans will have the opportunity to get a high-quality Gladiators tumbler before the game for only $5. For more information about Hockey Fights Cancer fundraising opportunities for your organization please call 770-497-5100. The 16th season of Atlanta Gladiators hockey continues at the Infinite Energy Arena Friday, November 16th against the Norfolk Admirals at 7:35 PM. For ticket information, visit the official team website at www.atlantagladiators.com or call the main office line at 770-497-5100. Hockey Fights Cancer weekend will continue to raise funds and support cancer organizations, and the team will also hold its Nickelodeon Takeover Night featuring the Teenage Mutant Ninja Turtles! Join us for a pre-game Meet & Greet with the turtles, Teenage Mutant Ninja Turtle Jerseys and jersey auction post-game, and lots more Nickelodeon-themed fun! - $10 Sports X Club Level Tickets with Code "SportsX"
- $50 Meet & Greet includes ticket to the game, meeting the Teenage Mutant Ninja Turtles, and a dinner before the game! Watch Rise of the Teenage Mutant Ninja Turtles on Nickelodeon! More Nick: ECHL Announces Partnership with Nickelodeon for 2018-19 Season!